Most of the time, our clients are having troubles when it comes to transportation. They are unable to personally drive their cars to certain appointments. They may not have any family member available to give them a ride. Haney’s Heart To Heart In-Home Care LLC believes that illness, disability or old age must not be a reason for a person to just stay at home and feel alone all the time. 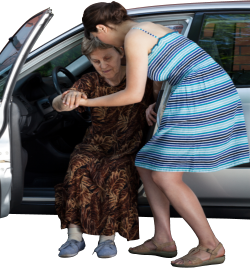 We can lend a helping hand in assisting you with your transportation needs. Give us a call at 314-724-4677 and let us help you with your situation today.